This has to be one of the most bizarre things I've ever seen an NBA player do. As someone who has given their fair share of wet willies, I have no idea what Delonte West was doing here when he gave Gordon Hayward one. And apparently, neither did West who says he has no problems with Hayward but he apparently got "caught up in the game" and thus earned a technical. Let's go to the videotape. I mean, that's just so bizarre it's hilarious. What is also hilarious is that the Jazz announcers for Root Sports Utah, the awful Craig Bolerjack and former forward Matt Harpring, lost their minds and were acting like this was the most disgraceful thing they had ever seen. Get off the high horse and enjoy something that you can't not laugh at, gentlemen. Update: West has gotten fined by the league. 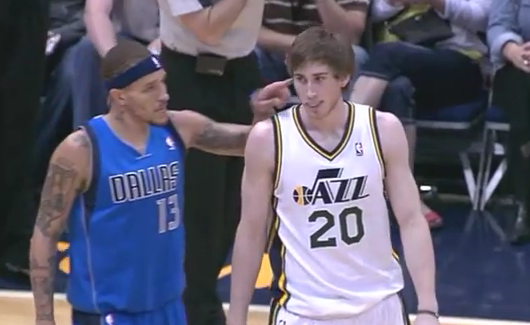 Mavs guard Delonte West fined $25,000 for giving Utah's Gordon Hayward a wet willy on Monday.